This delightful modern chapel is hidden away in the gardens of the Anglican shrine, and is probably the least visited of all the churches in the Walsingham orbit. It was built in the 1960s for the Anglican Guild of Holy Souls. The architect was Lawrence King. The Guild had been formed by members of the Anglo-catholic movement in 1873, to carry out a task that had been abandoned by the Church of England at the Reformation: the saying of prayers for the dead. This activity had been circumscribed by the Anglican reformers in the 16th century, because it presupposed the existence of purgatory. This was anathema to the reformed faith. As the Anglican church rediscovered its Catholic roots in the exciting middle decades of the 19th century, there were those who sought to restore to life this aspect of pre-Reformation worship, which had been at the heart of much private devotion in the late medieval period. Indeed, it had been the need to ensure that prayers were said for the dead which had led to the renewal and rebuilding of many East Anglian churches in the 15th century, as wills and bequests gave money in return for those prayers. A guild chapel had been the intention from the start, but the activities of the guild were deeply frowned upon by the Church of England, and its ideas have only ever been heard on the fringes of Anglicanism. 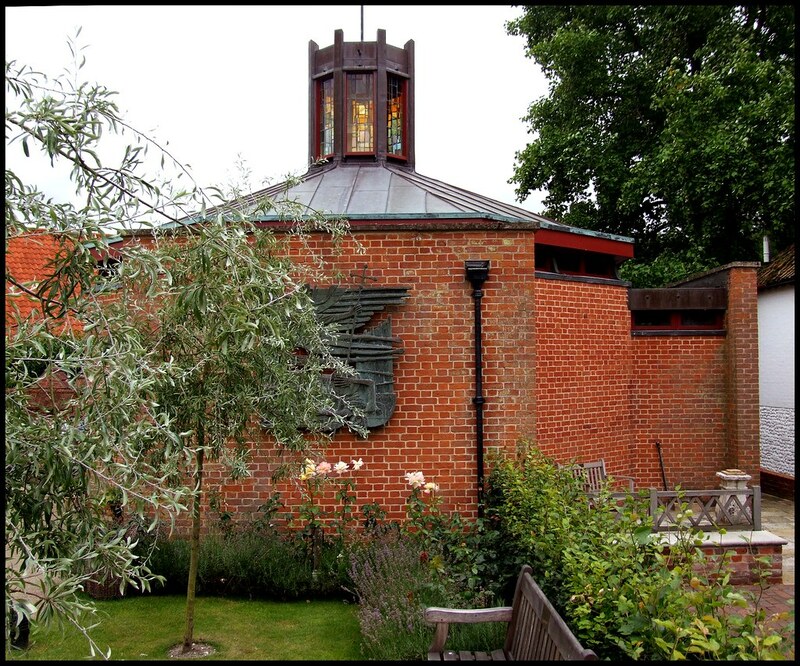 A chapel was maintained at St Stephen, Gloucester Road in London for many years, but it was not until 1965 that this pretty chapel found its home at Walsingham, the heartland of Anglo-catholicism. The octagonal building has echoes of the Catholic Cathedral in Liverpool, the roof rising to a crown of light, the lantern at the apex of the roof. 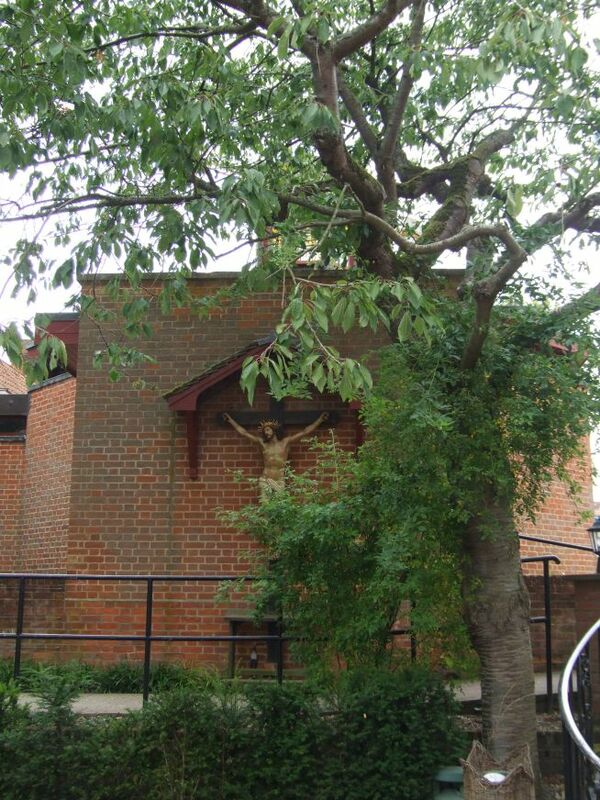 A sculpture of St Michael by John Hayward, also responsible for the font cover in the parish church, is situated at one end, a crucifix at the other. The inside of the church is pleasingly open, with a sanctuary flanked by glass walls at the far end. The lantern above is superb, and another band of coloured glass creates a dramatic effect below the roof line. The space is organised for a college of Priests, their seats around the outside. The Guild prays for its members, but also for the souls of all the Anglican dead.